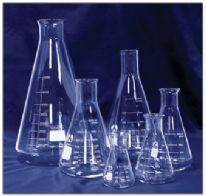 Erlenmeyer flasks are perfect for yeast propagation. Heat water in the flask to sterilize, then cool, then add yeast culture. The advantage is that it is all done in the same vessel.